The mobile phone landscape in India is on steep rise, even after about a decade of incessant growth, and from the looks of it, it does not look like it will slow down anytime soon. Just to give you an idea of the growth, around 95 phone brands launched 1137 new phone models in 2014. This means 3 new phones were launched everyday throughout the year in 2014! In comparison, 957 new phones were launched in 2013, a growth of nearly 20 percent. The mobile phone landscape report released by 91mobiles.com found that not only the growth in number of mobile phones has been tremendous, even the average price of the phones has increased by almost 18% over the course of the year. One of the reasons for the phenomenal growth has been that new and resurgent brands like Xiaomi, Motorola and Lenovo grew sharply in their popularity. Interestingly, Indian and International brands both grew at same pace. 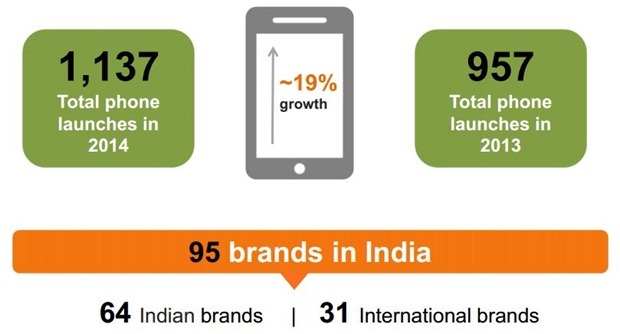 However, number of new phones launched by Indian brands were more than double that of International brands (476 vs 215). 1 Online Only Model, A Big Hit! Online Only Model, A Big Hit! Selling online only model grew sharply in popularity over the course of the year. Searches made by users in regards to online-only models grew from less than 5 percent in February to almost 20 percent by the end of the year. Smartphones in the Budget segment (Rs. 5k to Rs. 15k) were most popular and new entrants to Indian market mostly attacked this segment. Brands like Obi, Oppo, Asus Mi and Motorola each launched multiple phone models in this segment in India. Compared to previous year, 2014 saw the popularity of budget segment rise by over 13 percentage points. Popularity of budget smartphones grew from 46% in 2013 to close to 60% in 2014. While the overall mobile price witnessed a 18 percent rise, when it came to Smartphones, the average selling price of smartphones fell by 19 percent over the course of the year. 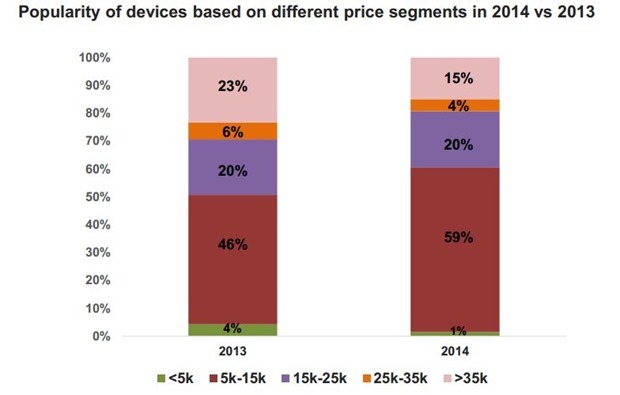 The average selling price of the smartphones in January 2014 was Rs. 8,118, which came down to about Rs. 6,603 by December 2014. Google’s much talked about Android One initiative launched last year did not find too many takers. Multiple Android One Smartphones were launched by multiple brands, but none of them even made to top 100 phones on the basis of popularity on 91mobile.com website. The price point of the phones at Rs. 6000 was still higher than what Indians had expected and hence not many people went for these phone. 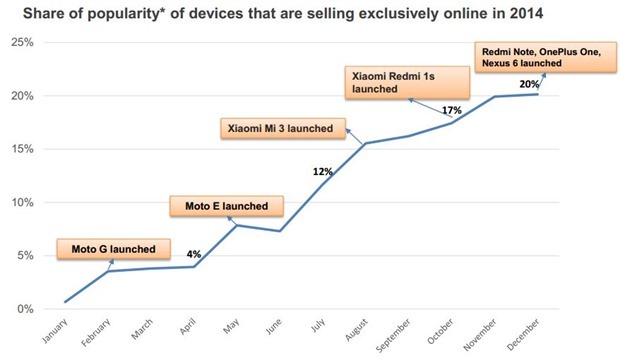 In addition to this launch of feature rich phones at lower price point like Redmi 1S severely dented their demand. In 2014, with arrival of value for money phones from Asus, Motorola, Mi and Huawei, the high specification phones witnessed price fall by more than half. 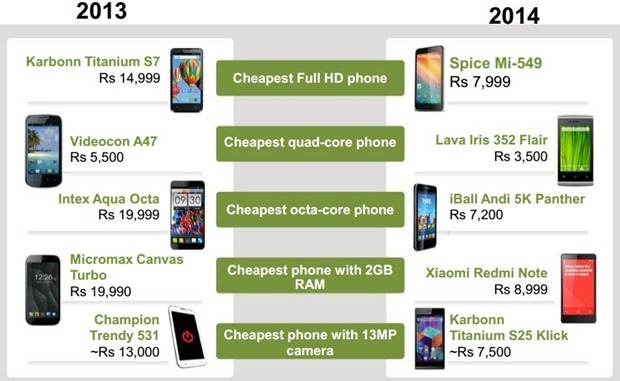 Cheapest full HD phone in 2013 was priced at Rs. 15k, the price for same came down to Rs. 8k in 2014. Cheapest quad-core phone price came down from Rs. 5.5k to Rs. 3.5k. Check out the comparison below. Despite the smartphone segment being abuzz, feature phone launches kept growing. Karbonn launched maximum number of smartphones in 2014 followed by Intex, Micromax, Lava and XOLO. Samsung still had most popular smartphones in all 3 segments – Budget, mid and high. Here is the entire report from 91mobiles.com. Need a correction here : In comparison, 957 new phones were launched in 2015, a growth of nearly 20 percent. It should be 2013 and not 2015. Thanks for pointing out Siddharth. It was a typo, corrected now!